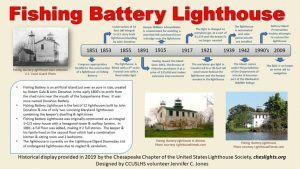 Program: Lighthouse Historical Placard – Chesapeake Chapter U.S.L.H.S. 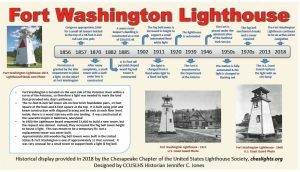 This program was established in 2016 with a goal to educate the public about the history of the lighthouses within the Chesapeake Bay, both existing and those no longer standing. The method is a professional historical placard placed on government land or property (federal, state, or county) outdoors near the shore, (or indoors if there is public access and no appropriate outdoor location) ideally facing the lighthouse or its original location. The restriction for the placement of the placards on government property is to take advantage of the increased level of security at these restricted-access facilities. Indoor placards can also be placed inside nonprofit lighthouse/maritime-related museums. The Chapter has performed the research on all of the lighthouses within the Chesapeake Bay. This research was conducted by Chapter volunteers at both the U.S. Coast Guard Historians Office and the National Archives. Chapter volunteers design the artwork for these placards with this research, and use the best available photos. Both the indoor and outdoor historical placards are normally provided to the government or nonprofit organization free of charge. The project is funded solely from the Chapter budget. No sponsors are used for the purchase of these placards. The Chapter would like to recognize Jennifer Jones, Greg Krawczyk, Claudia Talbott, Cory Talbott, and the South River High School (Edgewater, Maryland) History Club for their contributions to this effort. The first historical placard was delivered in December 2017. How are the placards created? The Chapter volunteers prepare the artwork in PowerPoint, as this is the preferred program for the outdoor placard manufacturers, and foam board providers. The Chapter seeks approval of the artwork as well as the size by the organization receiving the placard. All artwork includes language indicating that the Chapter provided the placard, our web site, and the name of the Chapter volunteer that prepared the design. Photos indicate the origin or credit as applicable. For indoor placards, the sizes available for foam boards are listed on the Vistaprint web site. Indoor placards usually are 18” x 28” or smaller. For outdoor placards, the Chapter coordinates with the receiving organization on the installation. For indoor placards, we typically deliver the placard, and the receiving organization installs/mounts the indoor placards. The Chapter requires that the indoor placards be mounted in a location where the greatest amount of people visiting the facility can view and read it. The indoor placards are not provided for installation in private offices. The indoor placards then become the property of the receiving organization. However, the Chapter requests that the receiving organization not alter the placards, although it is acceptable to trim/remove the blank white portions along the top and bottom.